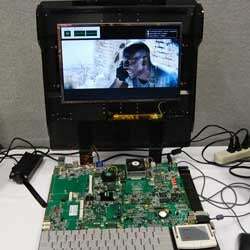 • The Puma mobile chipset, due out in Q2 of this year, is able to play the Transformers HD DVD (intense MPEG-4 AVC) and still have 40% to 60% of the processor left over. Normal laptops today use almost 100% of their processors on Transformers, and still drop tons of frames. • Hybrid Crossfire will enable a cheap-o PC with integrated graphics to deliver a 1.7x speed bump when combined with a cheap-o discrete graphics card.